This firing pin blocking mechanism on the Series 80 Colts differentiates the Series 80 Colts from the “true” M1911A1 pistols. The M1911 and M1911A1 pistols do not have this device. The purpose of the firing pin block is to prevent the firing pin from moving forward unless the trigger is depressed. 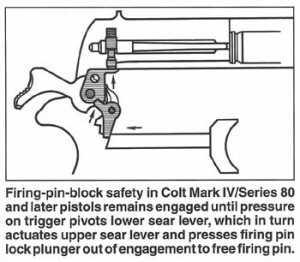 This “lawyer friendly” mechanism is supposed to prevent “accidental discharges” caused by dropping the pistol or catastrophic mechanical failures. Many 1911 purists feel that the firing pin block adds some mush to the trigger pull although it isn’t very much. Remember that no mechanical gadget can replace the safety device which resides between your ears.